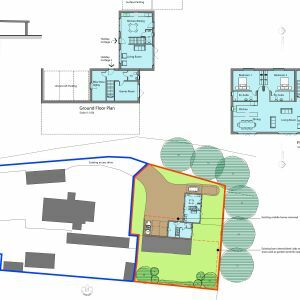 Purbeck District Council: Darryl Howells has won an appeal for the erection of a pair of holiday cottages with associated parking and access following demolition of an existing barn and removal of a mobile home. The site is located outside the settlement boundary of the village of Lytchett Matravers near Poole and within the Dorset Green Belt. The planning application prepared by Simon Morgan of Morgan Design Studio was refused outline planning permission following debate of the Purbeck District Council Planning Committee. The reason for refusal alleged that the proposed use was inappropriate development to the Green Belt and the proposed development would harm the openness of the Green Belt. Having received advice from Pure Town Planning, the refusal was appealed without delay. The Planning Inspector opined that the construction of the new holiday homes was inappropriate development having regard to paragraph 89 of the National Planning Policy Framework (NPPF). There are exceptions to this rule, provided the use is the same and the replacement building is not materially larger. As the existing use was the storage of non-agricultural items and the proposed use was holiday homes, the exception rule was not accepted. The Planning Inspector then considered Darryl’s argument that the substantial reduction of massing would justify the proposal as there is no material harm to the openness of the Green Belt. The existing building and mobile home to be removed had a combined volume of 1491m³ whereas the replacement building had a volume of 894m³ – a reduction of 40%. The Inspector agreed with Darryl that this reduction meant that harm to the openness of the Green Belt would not occur. In allowing the appeal, the Inspector took a balanced view concluding that whilst the proposal constituted inappropriate development, the increased openness of the Green Belt compared to the existing building, the promotion of the tourism offer, the benefit to the local employment and the lack of visibility would all outweigh the initial harm and there would be no conflict with the five purposes of Green Belt designation which are set out in paragraph 80 of the NPPF. Looking at the case as a whole, the Inspector decided that very special circumstances exist which justify the development. If you have recently had planning consent refused contact Pure Town Planning for an honest appraisal of your chances of having it overturned on appeal – our initial consultation is free so there is nothing to lose!